You knew these pumpkin spiced donuts had to be coming. I am so in love with my donut pans! Boy, I can tell life has changed for me when I am getting excited about baking pans! I just had to share these pumpkin spiced donuts with you! Having the ability to make healthy donuts is huge when you have kids. My daughter has no idea they are healthy, but since they are in donut form, she will gladly eat them. Even my 18 month old ate these and she is mostly tube fed still. This recipe is very similar to my Pumpkin Chocolate Chip Muffins. In another bowl, mix the wet. Bake for around 10-12 minutes or until a toothpick comes out clean. I got 12 donuts and also 3 regular sized muffins out of this batch. They are super good when they are fresh out of the oven. Enjoy! Hi there! I made these yesterday with my brand new donut pans. I was so excited. However they didn't rise for me. You have listed baking soda, should it be baking powder? That's the only thing I could think of. The taste was great though! Really? I haven't had a problem. It might depend on where you live with altitude. Mine don't rise much, but they work well in donut form. Sorry that happened. Maybe next time try baking powder? Been looking for donut pans...what ones do you use? Have you ever made donut holes? I bought my donut pans at Bed Bath and Beyond for about $7 a piece. I have done donut holes in my mini muffin tins. I ordered mine from Amazon.ca (com). Hi there, I just made these donuts this afternoon and was so excited to taste them. However, I was so disappointed as they have such a strong pumpkin taste (that lingers long after). I know it's because I used E.D. Smith Pure Pumpkin (I don't have any fresh), but I'm not sure how to adjust your recipe to avoid this problem. Can you help? I am not familiar with that type of pumpkin. Is it a canned pumpkin? Do you not like the taste of pumpkin? If so, you can try using squash or sweet potato next time. I am sorry you didn't like them. Yes, it is a canned pumpkin with nothing added to it. The options you suggest both sound good, so will try them next time (probably the sweet potato). I do like the taste of pumpkin, but I think the canned stuff is just way too strong. Thank you your reply. I agree that canned does not taste as good as fresh. An interesting thing has happened....after sitting for a couple of days, the donuts have lost the strong, lingering taste and are now quite delicious! Great! Glad that worked out! Please let me know how they are with sweet potato if you try. These are so delish! Our donut maker just came in the mail yesterday and we made a batch of these. YUMMY! We also made a batch of your peanut butter chocolate chip donuts and loved them as well. Thank you!! So glad you like them! My daughter's favorite are the banana chocolate chip donuts. Why did you use white whole wheat flour? I was trying to make it healthier. White whole wheat is a whole grain believe it or not. I also use spelt flour on occasion. Never mind...figured it out. Didn't notice you noted how many cups of pumpkin in the recipe. 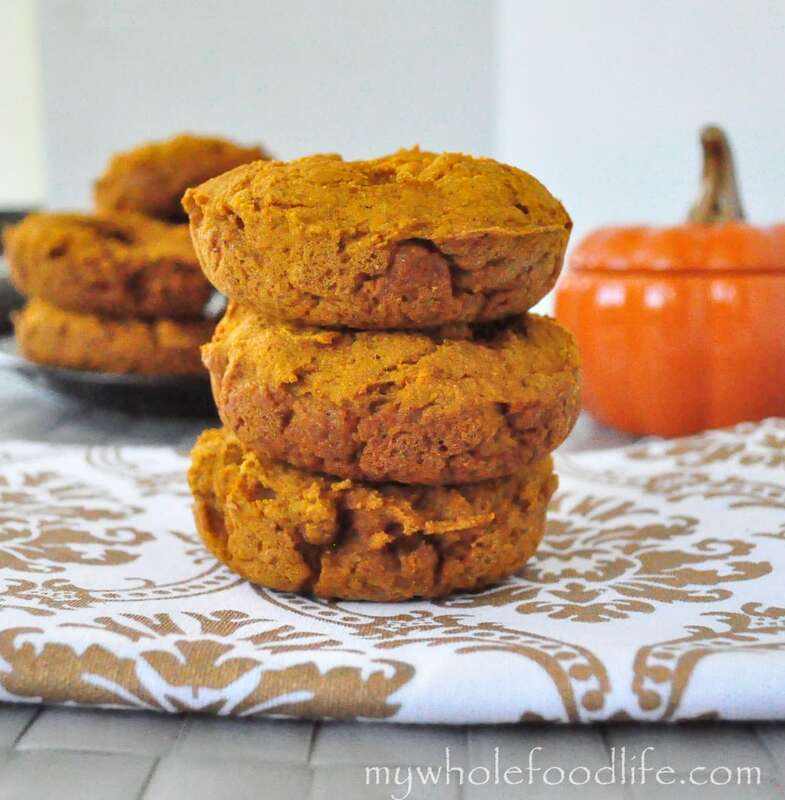 Could I use Almond or coconut flour to make the pumpkin doughnuts? Could you use honey in place of the sugar or maple syrup? Also, do you have to use a donut pan? Could I use my mini bundt cake pan? I'm just trying to save some money and use what I already have. I am so excited to try more of your recipes! My food processor came and now I can make your Larabars. Yay! Thank you so much for all your wonderful recipes! I'm loving not feeling deprived and giving myself the gift of health! Thank you, thank you! Any ideas for a raspberry and chocolate yummy? I love that combo! Do you have a muffin pan? You can make them into muffins instead of donuts. Yay for you getting a food processor. You will love it. I don't have any raspberry and chocolate recipes yet, but maybe in the future. You could try making chocolate cups filled with raspberry? I do have a muffin pan and a mini bundt cake one. Could I use honey instead of the sugar/maple syrup? How would I make the chocolate cups with raspberry that you mentioned? I love those two favors together! Thank you so much Melissa! Brought these into the office as a Halloween Treat for my co-workers. On half of them i added a little homemade cream cheese frosting and some sprinkles (the healthy kind) and the other half I left plain. They are all gone! !